I never ate refried beans as a kid. They just looked so…gross. Ugh. And while I love them now, I have to admit that they’re one of the homeliest side dishes around. Their puree-like texture, the way they just kind of plop, free-form, onto your plate, and that unappetizing pink-beige color, reminiscent of cafeteria lunches on The Simpsons. Sorry, I’m sure you don’t even want to read the rest of this post after that description. 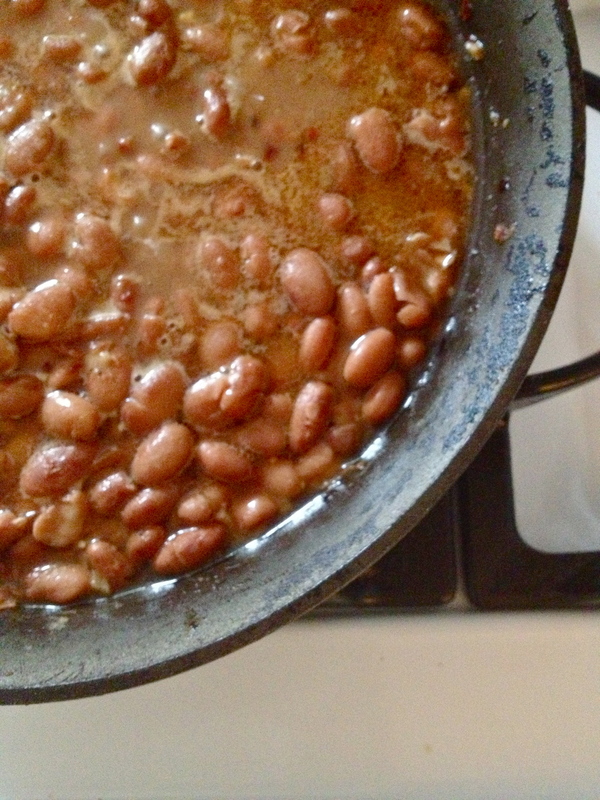 But folks, those bean-hating days are long gone, and today I don’t care how ugly refried beans are, because they taste great. So I made them for dinner, and in spite of their homeliness, they were pretty fantastic. 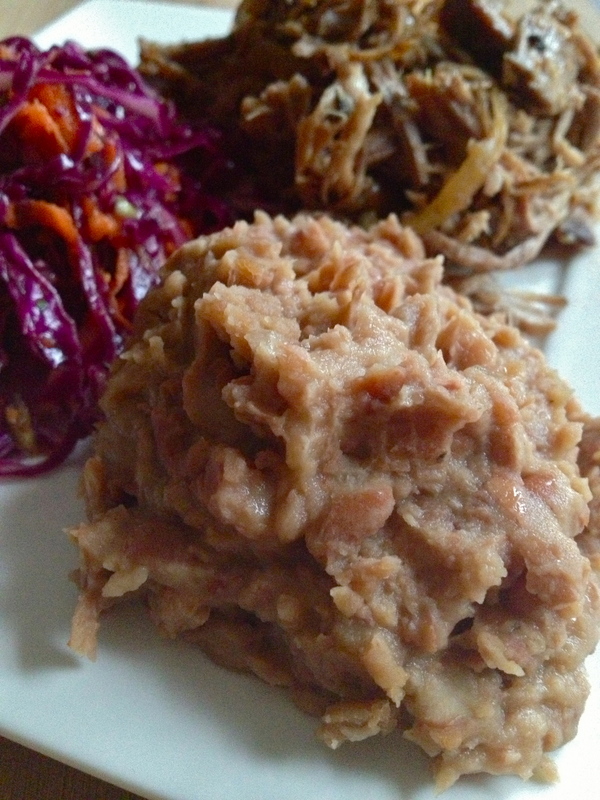 Rock on, refried beans, and don’t go changin’! 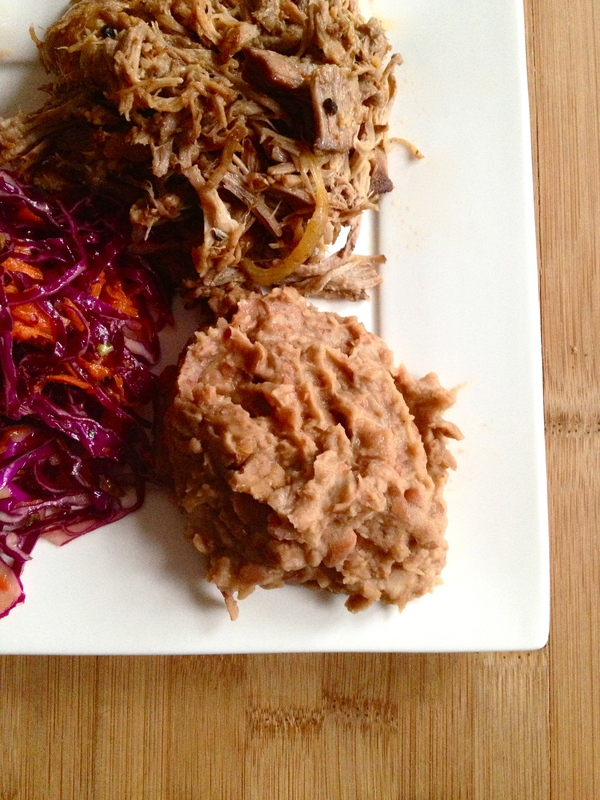 PS – I made these to go with my Spicy-Tangy-Sweet Pulled Pork, and I cooked my beans in some of the pork cooking juices. If you’re thinking this was a good idea…you are correct. Do it. Of course, they can be made vegan as well – just use water or vegetable stock instead of chicken stock or pulled pork juices. These are really easy. 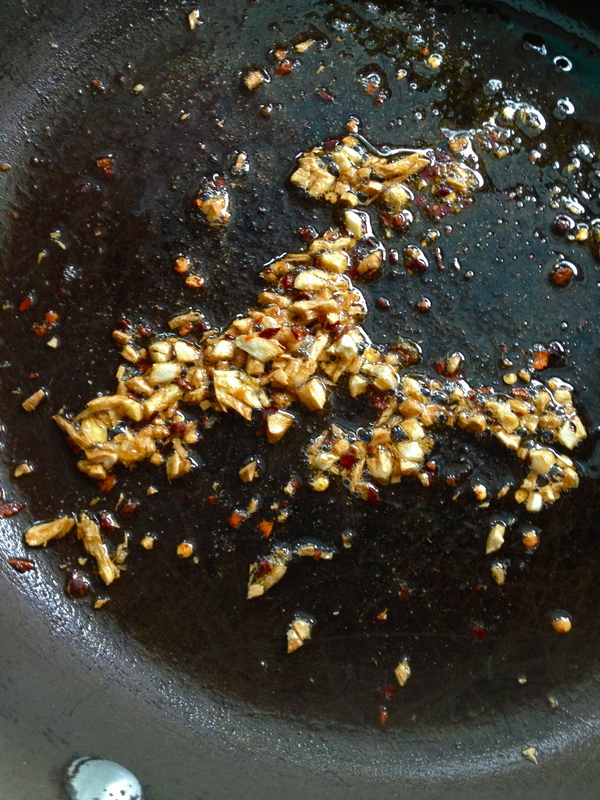 Heat the oil or bacon fat over medium low and add the garlic. When it’s softened, add the cumin and red pepper flakes and stir. Cook until fragrant, about a minute. Then add the beans, the oregano, and the water or stock. I HIGHLY recommend making these while a pot of pulled pork is cookin’ in the oven, because if you do, you can replace half (or all) of the water/stock in this recipe with the glorious cooking juices from the pork. It would be a really good decision, but it’s not a mandatory one. Stir and bring to a simmer. When the beans are heated through and some of the liquid has cooked away, grab a potato masher (or even a fork) and mash the beans to your heart’s content. I like my beans on the smoother side, so I work the masher quite a bit. But do whatever floats your boat. If the beans are how you like them, turn off the heat. If you want to cook away a bit more of the liquid, turn the heat up to medium high and cook, stirring consistently, until the beans reach desired consistency. Stir in some shredded cheddar cheese if you like. That’s all, folks. 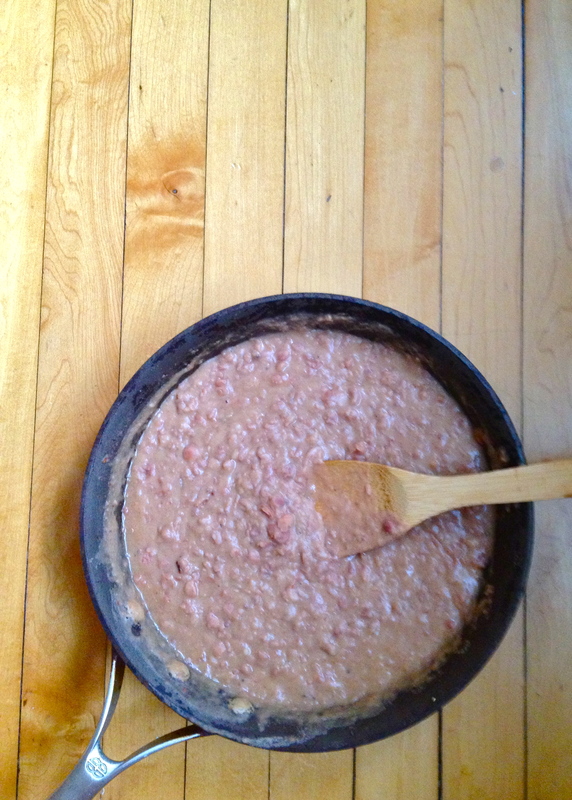 Refried beans from scratch: they’re ugly on the plate, but beautiful in your mouth. And may I plug my own recipe again by suggesting that you serve these with Spicy-Tangy-Sweet Pulled Pork? Yes I may. 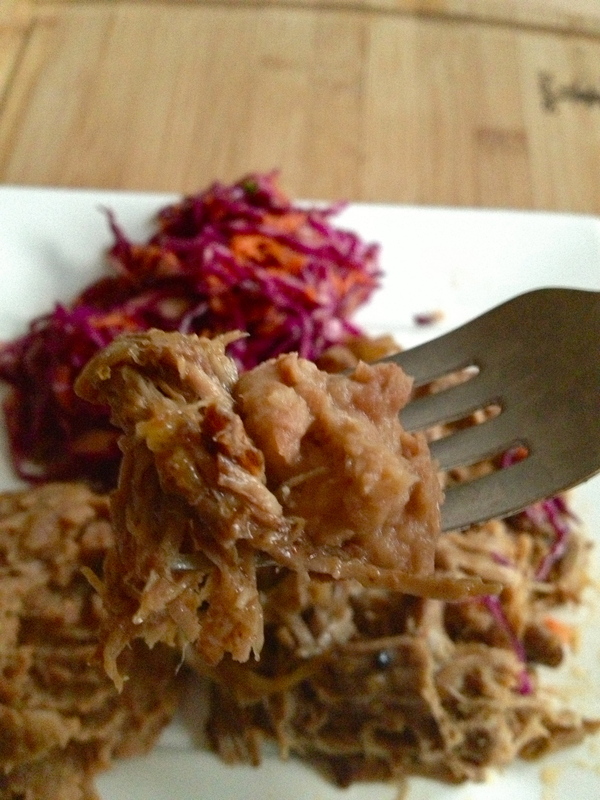 Previous Why I Feel Like an Empowered Shopper, and Spicy-Tangy-Sweet Pulled Pork. Next Caprese-stuffed Chicken with Basil Oil and Balsamic Glaze. At this moment, you’re more Hispanic than I am. However, if I follow your delicious recipe just once, I’ll bring order back to the universe. This looks awesome! for another good, healthful use for it.